Dimplex North America Limited is considered one the best and most diverse manufacturers of electric heating devices. They make high-quality products at affordable prices and their electric fireplaces are world class. 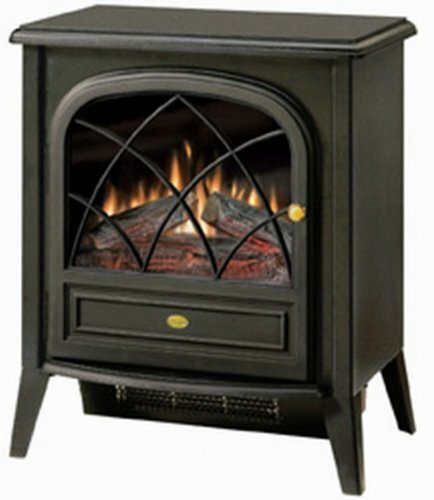 We were happy to review, in depth, these 3 Dimplex portable electric fireplaces. We rated the Dimplex Electric Stove CS-12056A as a ‘good’ compact electric fireplace stove. Why? Because it’s not bad, in fact it’s pretty good and has a reasonable price. 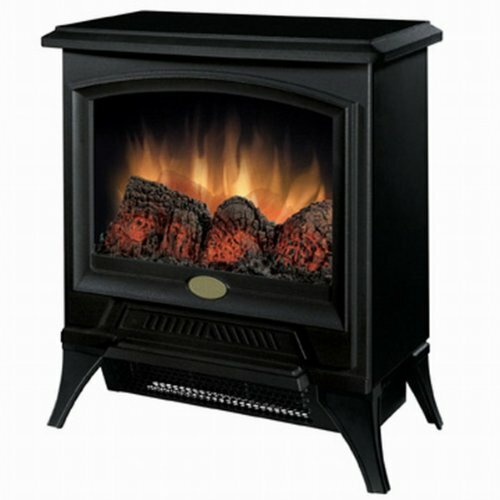 A lot of electric fireplaces stoves did not make our top 3. The strongest selling point in feature of this electric fireplace is, without a doubt, the price. So we don’t keep you in suspense will tell you that the price at the time of this writing was under $140. Click through on the button below to see if that discounted price is still in effect. The flame effects of this Dimplex electric fireplaces are adequate to good. They are not as refined as the top rated Celeste model or the middle rated model, but they are nothing to sneeze at. Most buyers were pleasantly surprised flames looked as realistic as they did considering the economy price point. Surprisingly, the heat output of this economy fireplace is the same as the other two models. The explanation is actually quite simple a standard electrical outlet can only handle about 1500 watts and produce around 5,000 BTU’s before it will blow a circuit. So almost all of electric fireplaces in terms of heating capacity nudged right up toward those maximum numbers.In a nutshell, you are not sacrificing heating capacity for economy. In terms of customer satisfaction, as might be expected this economy model scored a bit lower than the other 2 discussed. 66% of all buyers rated it either 4 or 5 stars, (compared to 80% on our ‘better pick’ and 86% on the ‘best’ pick). The Dimplex Compact is a lot of stove for the money. It has a standard heat output and the flame effects are fairly good. It is easy to control and inexpensive to run. If you are looking for a budget stove then this Dimplex compact electric fireplace stove is worth a look. Why do we rank the Dimplex Compact Electric Stove Review CS33116A as the ‘better’ of the 3? Well, that’s the way we see it. 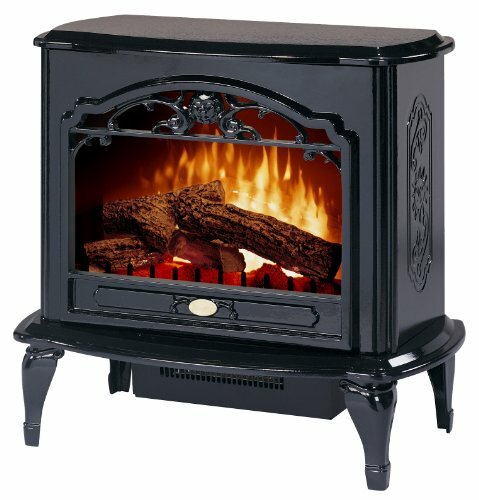 In our comprehensive review of this electric stove fireplace we state “We really like this decorative compact fireplace stove. We love the classic styling and great realistic flame effects. It is a good value at a modest price point.” Better performance that doesn’t cost an arm and a leg…we’re there. This compact electric stove has more features and a higher technology level than our ‘Good’ selection. This features the Dimplex three-dimensional flame technology. Many people feel is one of the best in the industry. There are no fancy colors or special effects, the flame, the logs, and the embers are striving for realism. Most customers feel the flames and glowing embers are very realistic looking and love the ambience it creates. The heater has two settings which are low and high heat. The output of the heater is designed to heat a room of up to 400 square feet. This is the same for all three electric stoves we are looking at in this class. There were a large number of reviews for this Dimplex fireplace on Amazon. In terms of customer satisfaction 80% of all buyers rated it either 4 or 5 stars, (compared to 86% on our ‘best pick’ and 66% on the ‘good’ pick). This fireplace falls in the middle of the 3 as expected. But, surprisingly there is little difference between this fireplace and the more expensive Celeste – rated ‘best’. Why do we consider Dimplex Celeste Electric Fireplace Stove the best of the three compact electric stoves? Well, there are number of reasons. In our comprehensive Dimplex Celeste Electric Stove review, we called it the Rolls-Royce of electric fireplace stoves. We still believe that to be true. This electric fireplace is unique in that it has an air filtration system built right in. It features a much larger than average viewing area. It is also available in two colors a glossy black, or an ivory white. The flame system on the Dimplex is patented and it gives very realistic flickering flame effects. On this particular model, there is a downlight on the logs which provides a very realistic effect. In this particular model the flame effect is very three-dimensional. It is designed to filter out particulates and airborne allergens that exist in any room as the hot air is expelled. This will be particularly helpful to people who are sensitive to these allergens. The heater is designed for up to 400 square feet, as is the other models. 83% of all purchasers rated this compact electric fireplace four or five stars. The Dimplex Celeste has the best looking flame effects and the most attractive design of the 3. The question that only you can answer is it worth the price to have the best?